We do occasionally get requests for full body burial at sea. As you may suspect there are many regulations governing this and it will require coordination with a funeral home. The price for a full body burial varies a fair amount given the location and the options (casket, shroud etc.) requested by the family. Although more expensive than an ash scattering the full body burial at sea is still much less expensive than a traditional in ground burial. We will be able to provide answers to any questions you many have and provide you with a quote should you be interested in this type of service. 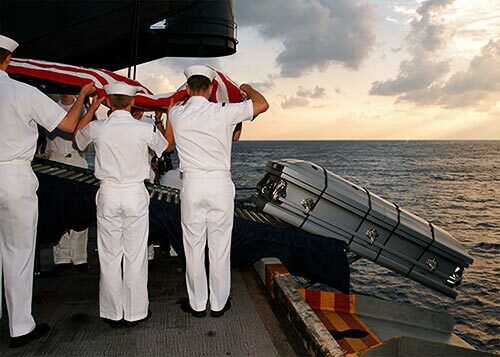 The military (navy) does offer full body burials, however they do not allow the family to attend. Using a private service like we provide allows the family to be present and say their final goodbyes. There is a choice of either to use a casket or a shroud for the service. The full body burial at sea is actually very similar to a traditional earth burial in that there is a body present. As well, the same emotions may be present with the family knowing that there loved one’s body is physically there. We often suggest using 2 yachts – one acting as the hearse to transport the deceased to the location and another yacht acting as the limousine to carry the family. This way there is some separation and the family does not have to ride back to port with an empty space on the vessel where their love one used to be.